The first volume of Gilbert Burnet’s (1643–1715) History of the Reformation appeared in 1679. As a Protestant Whig, his message was that Catholicism and Englishness were incompatible: Catholicism was tyranny, Protestantism liberation. The book was a huge success and greatly enhanced Burnet’s reputation. One critic, however, was Henry Wharton (1664-1694), who took the then fashionable attack of line-by-line analysis, picking up inconsistencies and errors, especially relating to manuscript sources used by Burnet. Wharton found 89 faults in a work that was trumpeted as perfect. Here is Wharton on the clergy misbehaving. 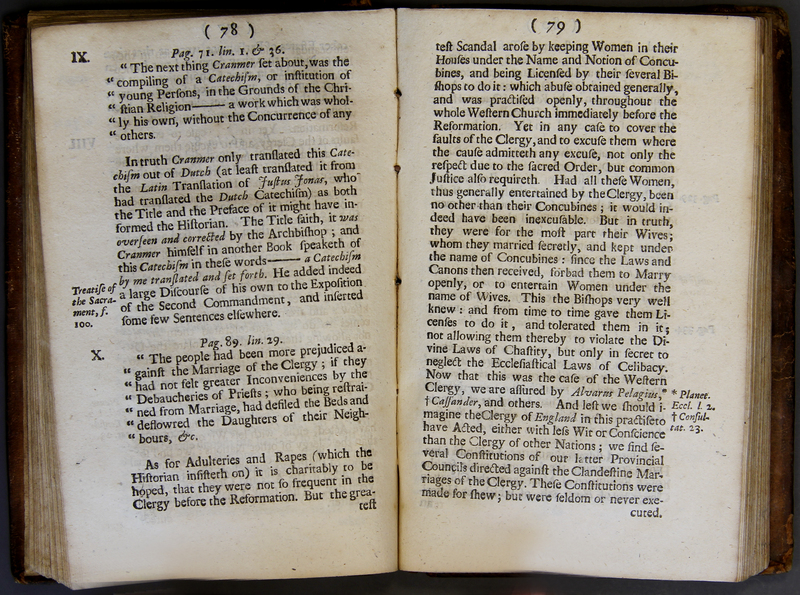 [Henry Wharton], “A Specimen of Some Errors and Defects in The History of the Reformation of the Church of England,” ourheritage.ac.nz | OUR Heritage, accessed April 20, 2019, http://ourheritage.ac.nz/items/show/10373.